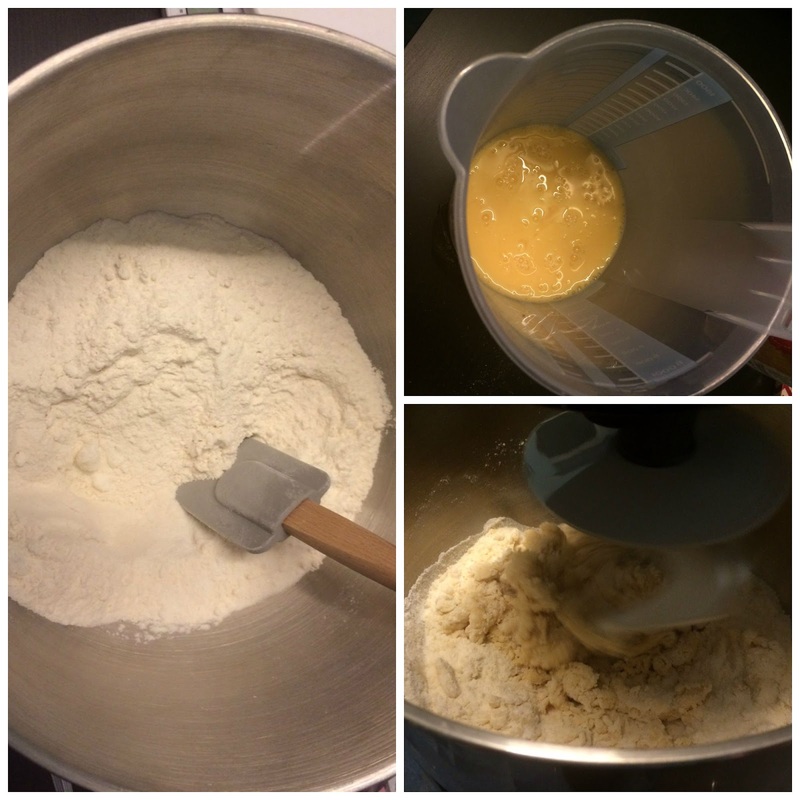 Welcome to Week Two of the #BloggersBakeAlong, this week on GBBO was all about the biscuits! The show featured Biscotti, Arlette's and show-stopping Biscuit boxes filled with biscuitey goodness. I really REALLY wanted to make a biscuit box, but as I am off to Summer in the City this weekend I knew I really wouldn't have time. 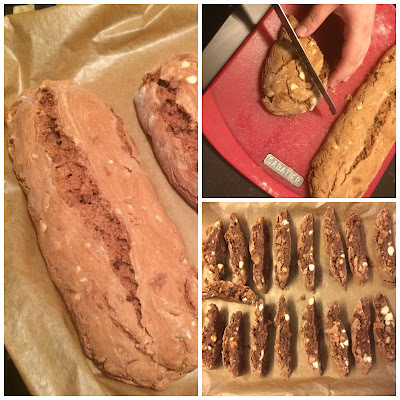 So instead set myself the simple challenge of making two types of Biscotti (sarcasm). 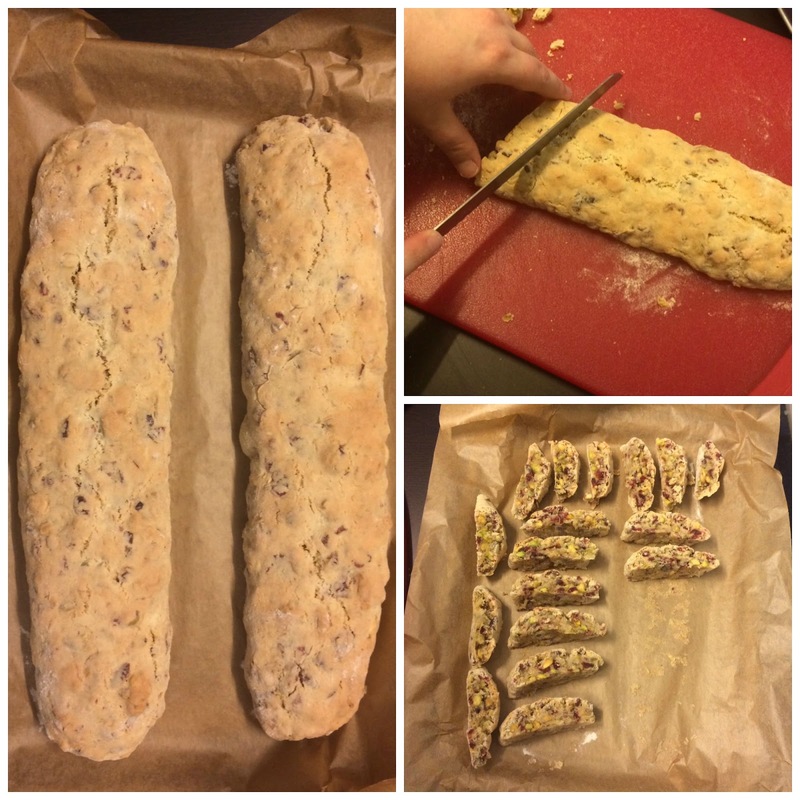 So as soon as I settled on Biscotti I went in search of a recipe and was glad to discover once by Paul Hollywood online which you can check out here. 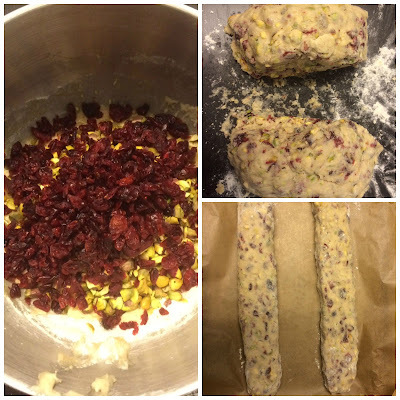 On the recipe Paul gave three flavour variations to add to a basic biscotti mixture, and I honestly couldn't settle on one, so I made two, Pistachio and Cranberry, and Chocolate, Almond and Orange flavours, both of which made my mouth water... 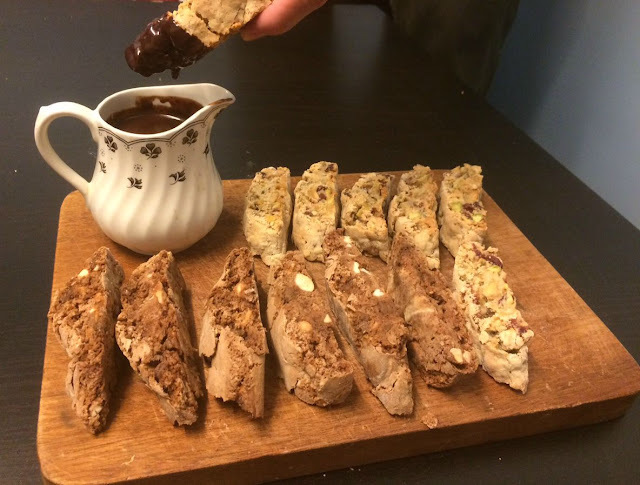 I also saw in the picture for Paul's Biscotti that he had some sort of dipping sauce, so I decided to make a dark chocolate to go with mine, the recipe for which can be found here. I started by making the basic Biscotti mixture, which involves mixing together flour, sugar and baking powder, and slowly adding egg until your dough starts to form. Now with my pistachio mix I managed to make a super wet dough, because I added WAY too much egg but it turned out alright in the end! 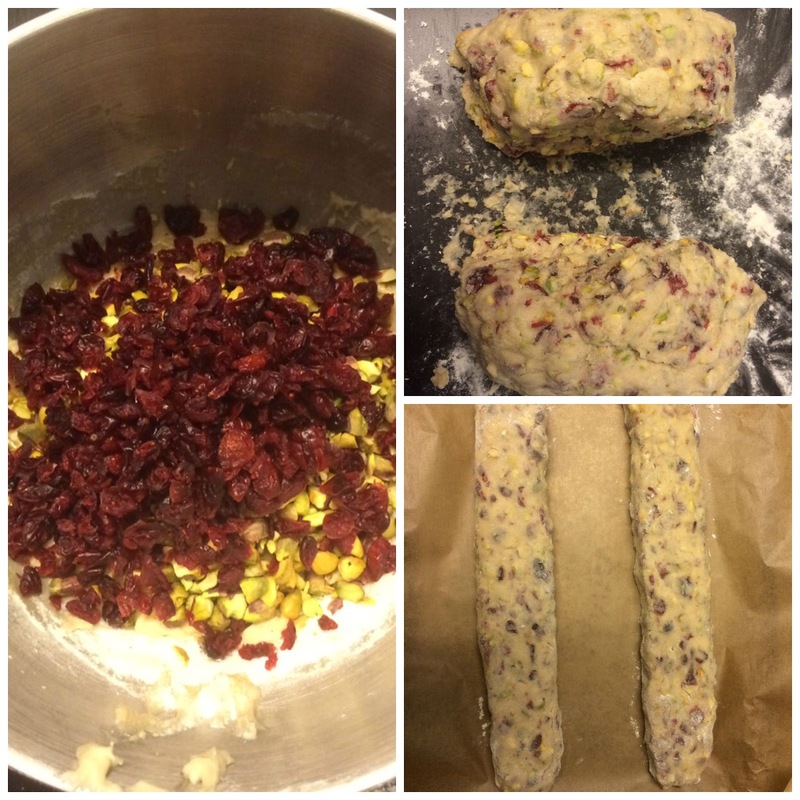 Then I added my roughly chopped pistachio's and cranberries and folded them in with my hands. A little bit of kneading later and my dough was ready to be shaped, so I divided it in half and rolled it into two sausage shapes... this part was surprisingly easy considering I am terrible at shaping dough! 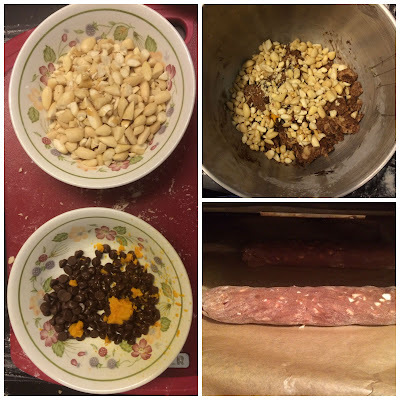 Then it was time to make the chocolate mix. I repeated the same mixture as my first batch but adding 30g extra flour, and then adding 50g melted dark chocolate after adding the eggs. Once combined I threw the ingredients in kneaded the dough, making it into two sausage shapes again. Then I popped both batches into the oven for 30 mins for their first bake. I'm still trying to think of new and creative ways to display my bakes... but what do you think?